The patient is unable to give a coherent history. His friend volunteers that the patient had seen a GP in the past few weeks as he was feeling depressed. The friend also admitted that the patient occasionally used recreational drugs such as marijuana and ecstasy. Further of examination of the patient was notable for the presence of shaking eye movements, brisk deep tendon reflexes and stiffness of the lower limbs.Before answering the questions – do you remember this from Toxicology Conundrum 017? Q2. Describe the clinical manifestations of this condition? 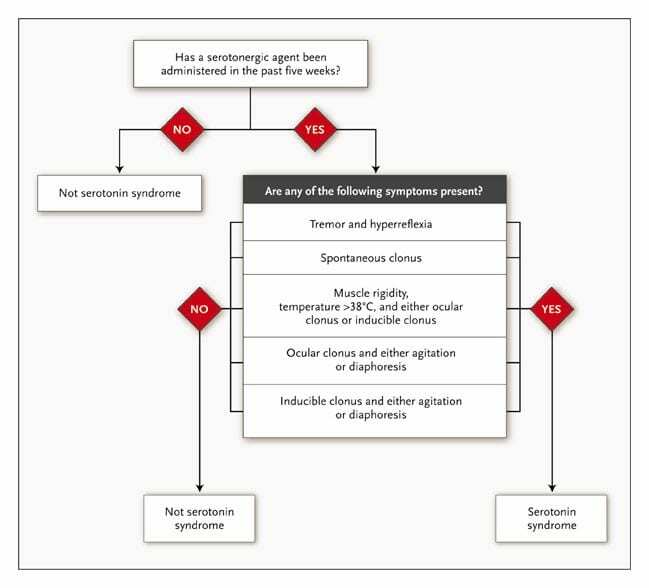 Serotonin syndrome typical resolves within 12 -24 hours. Exceptions may occur following massive overdoses, in the presence of multiple serotonergic agents (especially MAOIs) and in the context of intercurrent illness. Q3. How is this diagnosis made? Serotonin toxicity can be diagnosed using the Hunter Serotonin Toxicity Criteria. The Hunter Serotonin Toxicity Criteria – believe it or not – are simpler than the original Sternbach criteria for diagnosing serotonin syndrome and are more sensitive (84%) and more specific (97%). In practice, the diagnosis is often more of a gestalt impression based of the history, absence of other causes and the findings on physical examination. Q4. What are the main differential diagnoses? 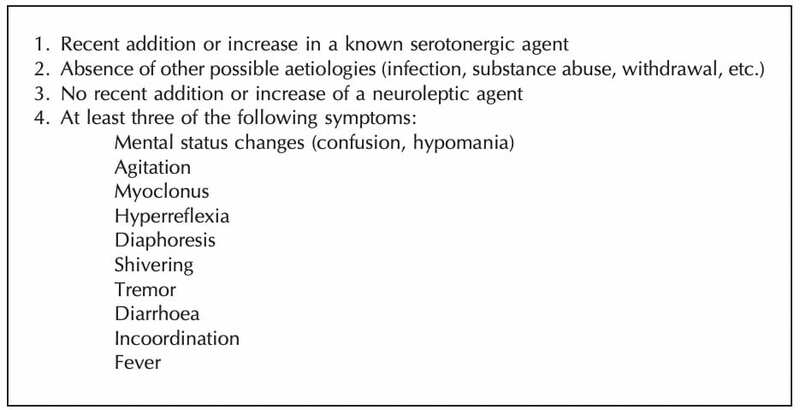 The differential diagnosis of serotonin syndrome is extensive. Q5. What are the potential underlying causes? Q6. What investigations are indicated? screening tests – ethanol level, APAP level, ECG, BSL. check for complications and rule out other differential diagnoses – CK, urinalysis (including myoglobin), UEC, ABG as required. Q7. When would you consider intubating and ventilating this patient? Q8. Describe your management plan for this patient? 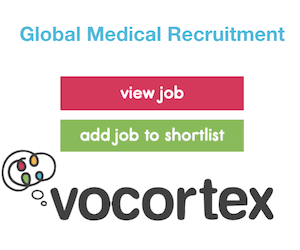 Assess the patient in a setting suitably staffed and equiped for resuscitation and monitoring. e.g. diazepam 5-10mg IV over 3-5 min (0.1-0.3 mg/kg in children) repeated as necessary. refractory seizures require intubation and ventilation with continuous sedation. Discontinue any sertonergic agents and avoid administration of further serotonergic agents. this patient has serotonin syndrome probably due to a combination of antidepressants and recreational drugs. It is likely to resolve over 1-2 days. More history is needed regarding drugs ingested, doses, times of ingestion and comorbidities. consider the potential for rhabdomyolysis – see Laboratory Tester #002 for management. Investigations — see Q6 above. activated charcoal (50g PO/NG) should only be administered if the airway is secure and will remain so (e.g. post intubation). Benzodiazepines are the mainstay of treatment as noted above. very mild cases may be discharged with symptomatic treatment, reassurance and appropriate follow up (e.g. GP or mental health team). patients with abnormal mental state or vital signs require admission (usually for about 24h) for observation, supportive care and pharmacotherapy until symptoms resolve. severe cases require ICU level care (e.g. intubation and ventilation). patients at risk of serotonin syndrome due to a deliberate self-poisoning should be observed for at least 8 hours and not discharged at night. This may vary depending on the risk assessment of the specific agent ingested. Q9. What are the 5 clinical settings when this diagnosis should be suspected? interaction of a therapeutic agent with a recreational drug or an alternative medicine. Q10. What is the likely diagnosis?